Cooking with Vân : About me. I was born and raised in Vietnam. In 2002 I moved to Malaysia for two years before setting off to travel through 12 countries with my Irish husband (we have since separated). I then traded my life in South-East Asia for life in the south-west of Ireland. 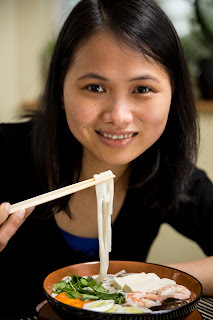 After we moved back to Limerick in 2007, I started teaching Asian cooking at Crescent College Comprehensive in 2008 and Brennan’s Cookshop before moving to Cork in the summer of 2014. I now work as a cooking instructor giving cooking classes, including team-building cooking classes and private cooking lessons at clients’ homes. I am currently living with my three children in Cork city, Ireland.